This Pata Hamonado is fall-off-the-bone tender and delicious. It is a sure treat for pork lovers. My husband, who is a self-confessed carnivore, devoured on it immediately. He even complimented me for it. I was a surprised because he only does that if he really likes something a lot. It looks like this recipe is a keeper. 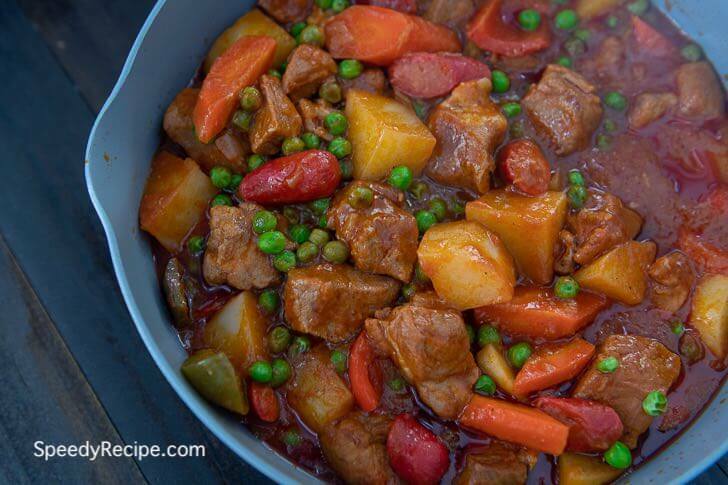 A good pork stew should be tasty and the meat must be tender. It can be quite challenging to tenderize pork hocks using the traditional method, which is boiling using a pot. This is when a pressure cooker gets handy. I can tenderize even the toughest meat in less than 30 minutes using it. Pata is the Filipino term for pork hocks. It is a common protein used to cook different dishes. One of my favorite dish using it is called “Pata Kare-kare”. It is similar to the Oxtail version, except that pata is utilized to make the dish. Other popular Filipino pork hock dishes include crispy pata, which is deep fried crispy pork hock, and pata tim. The latter is a tender stew involving the entire pork leg. Pata hamonado is an ideal dish for lunch. A typical meal would include white rice and a vegetable dish such as adobong kangkong. Have you tried cooking pork hocks? What were the dishes that you made? This is a recipe for Filipino pork hock stew with soy sauce and pineapple. 1 can pineapple chunks 20 oz. Pour water in a pressure cooker. Add pork hocks and 1 teaspoon salt. Pressure cook for 20 minutes. Discard the water. Set the pork aside. Pour cooking oil in a pot and apply heat. Saute onion and garlic. Cook until onion becomes translucent. Add boiled pork hock. Saute for 2 minutes. Add pineapple chunks with juice, soy sauce, and brown sugar. Stir. Pour beef broth or pork broth. Let boil. Cover the pot. Simmer until liquid reduces to half.